Diacutaneous fibrolysis is a method of treatment of the mechanical algias of the locomotor apparatus. Its mechanism of action consists on the destruction of the irritating adhesions and corpuscles that are formed between the different sliding planes of the soft tissues, by means of techniques with hooks applied on the skin. It produces a circulatory action by stimulation of the blood and lymphatic circulation. It is a technique of specific use in Physiotherapy. 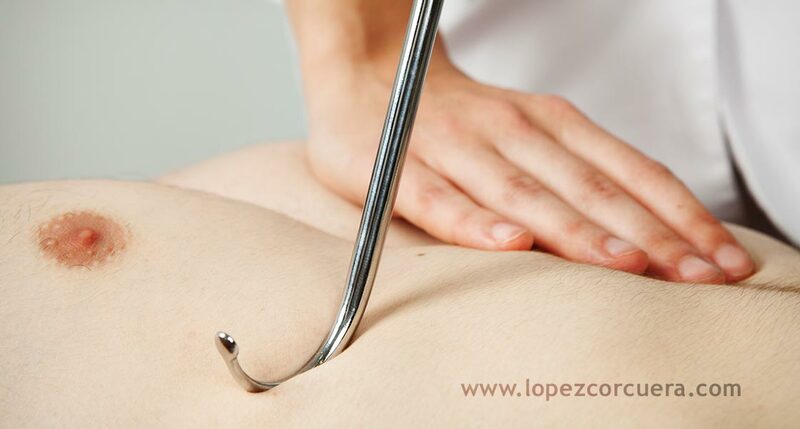 It is performed by means of stainless steel hooks and it offers excellent results in the treatment of various pathologies that affect the locomotor apparatus, especially applied at the level of soft tissues. Its action of release between the interaponeurotic or myoponeurotic septa restores the correct sliding of the different anatomical planes during the movement and solves the possible compressive phenomena that can cause pain and dysfunction. Adhesions (scar tissue that prevents movement) and fibrosis (collagen build-up) that form between muscles, tendons, ligaments, etc. are destroyed. This technique allows to penetrate more efficiently between the muscular fibres and to influence in places of difficult access for the manual techniques.